Alex Salmond has said motivation, morale and momentum are with Yes Scotland after his BBC debate with Alistair Darling. A poll taken after the debate suggested most people felt the first minister performed the better of the two men. But Mr Darling, leader of Better Together, said opinion polls still showed a majority support for a "No" vote in the referendum. Mr Darling insisted the momentum was with his campaign. 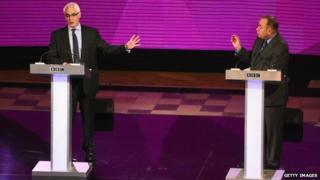 The two men took part in a BBC debate before an audience of 200 in Glasgow on Monday night. A snap poll by The Guardian newspaper and polling company ICM suggested 71% of those polled thought Mr Salmond had come out on top in the debate, against 29% for Mr Darling. Alex Salmond won. It was a hit, a very palpable hit. Several, indeed. How about the impact upon the referendum? I have been struck by how many have commented upon the "shouty" nature of the debate. I must confess that, personally, I am less concerned by that factor. But I have heard it mentioned, in conversation and on air, on numerous occasions. Might that prompt some to say "a plague on both their houses"? I think not. I have never seen people so engaged in a political process. I think folk will take what they want, what they need from the debate - and set it alongside other motivations: family discussions, their own research, their own thoughts and feelings. Last night's debate will undoubtedly energise the Yes camp still further - or, perhaps more precisely, lift any slight tinge of gloom persisting from the first televised outing. Ultimately, though, the people will decide. Speaking on Tuesday afternoon, Mr Salmond said that TV debates were "not the be-all and end-all". He said: "What matters is the impact on our ground campaign, which is our not-so-secret weapon. We're fighting the most energising, electrifying, extraordinary campaign in Scottish political history. "That's taking place in the town hall, village halls, towns, cities, streets of Scotland and the impact on the morale of activists is of fundamental importance." He added: "It's about momentum, it's also about argument. People in the next few days are taking postal votes into their hands. In a few weeks' time they're going to go into polling stations and take the future of their country into their hands. "When people do that, they're going to vote for something. They're not going to vote against something." Mr Salmond claimed that the No campaign had to "rely on big television things because they've got very little on the ground" in the referendum campaign. However, Mr Darling insisted the independence referendum debate would be a "fight right down to the wire". The former Labour chancellor said: "If you look at all the evidence, all the polls that have been published for the last few months, they consistently show us with a lead, most of them a double-digit lead. "I'm not complacent - a lot can happen in the next three weeks - but we have momentum. We're making good progress, our activity on the ground, on the streets, has been stepped up dramatically, the results we're getting in are extremely encouraging. I'm very optimistic, but I'm not complacent." From the start it was clear that Darling, who won the first debate, was edgy and nervy whilst Salmond was better prepared and more confident. Scotland's first minister had come prepared to answer the question that damaged him a few weeks ago - what's your Plan B? - if Westminster refuses to share the pound with a newly independent Scotland. He declared he had not one but three Plan Bs but what he was seeking was a "mandate" from the people of Scotland - a word he repeated again and again - to negotiate to share the pound. Salmond had also come with a new line of attack. He argued that the only way to protect the NHS and to stop welfare cuts was to ensure that the people of Scotland always got the government they voted for. He accused Darling - to the former Labour chancellor's obvious fury - of "being in bed with the Tories". His aim was clear - to increase the risks in voters' minds of a No vote. Overnight viewing figures suggested that 843,000 people watched the debate on BBC One Scotland - a 37% share of the people watching television in Scotland at the time. The average audience on BBC Two in the rest of the UK - 1.5m - represented a 6.8% share. An average audience of 104,000 watched a Sky News simulcast of the debate, 52,000 watched on the BBC News channel and 60,000 watched a later repeat on STV. Analysis by the Robert Gordon University in Aberdeen found 64,000 tweets were sent during the 90 minute debate, compared to 50,000 tweets during the two hour STV debate. Scotland will go to the polls in the referendum on 18 September, with voters being asked asked the "Yes/No" question: "Should Scotland be an independent country?" Media captionAlistair Darling on currency: "I want to know what Plan B is"
Media captionAlex Salmond: "This is our time, it's our moment, let us do it now"
Media captionAlistair Darling: "This is a decision for which there is no turning back"
As the people of Scotland weigh up how to vote in the independence referendum, they are asking questions on a range of topics from the economy to welfare. In a series running up to polling day, BBC correspondents are looking at those major questions and by using statistics, analysis and expert views shining a light on some of the possible answers. The issues they have looked at include Trident, Scottish economic growth, broadcasting, population, health and UK debt.